Faint light filtered through the trees nearly 7000′ above sea level, indicating that we had been out on the trail for over 24 hours. I had been moving very slowly up the 2000′ climb to Wagner Butte, causing my friend Tom to stop and wait frequently. I had no fire. I wasn’t sad or even slightly bothered about moving so slowly. I was just a bit sleepy. I finally sat down on a rock. I’m not sure how long I would have stayed there otherwise, but within 30 seconds I heard people approaching on the trail. A shot of adrenaline jolted me from the rock and I proceeded up the trail as though I had never stopped. Tom had waited for me and was happy to see me moving again. He was anxious to go ahead, as planned, at daylight. A small group of us soon arrived at the base of Wagner Butte, a pile of rough and rugged rocks about 50′ high. Another shot of adrenaline… I love bagging peaks. While others groaned in annoyance or disbelief, I happily picked my way to the top, where we each retrieved a flag as proof of our summit. Tom went ahead to finish super-strong. My legs were slowly warming up to the idea of running again. Then I bumped into my “selfie buddy” for the last time ~ a young man from Nashville who posed with me for several photos during the day. I thought it would be funny to have a bunch of photos with a random stranger on my camera roll. It was funny. And fun. Next I remember a section of steep downhill single track. My legs and mind weren’t quite ready for it. A woman passed me flying down the hill behind her pacer. So be it. Maybe I would be flying downhill if I had a pacer, I rationalized. The sun was warming the forest floor and waking up all sorts of buzzing bees, wasps, insects, etc… I have been apprehensive of buzzing beasts since I was stung by a honey bee last month. The Road 2060 aid station was about 3 miles off, and I had to decide if I would take one last Vespa supplement as planned. Vespa is made from wasp-extract and I can’t get the idea out of my head that it somehow contributed to me being stung by that peace-loving honey bee. I was finally feeling my legs run down the hill. I went through my pre-aid station list in my head. I imagine Betsy’s advice: dump everything and run light. There would be only 10 downhill miles to go. 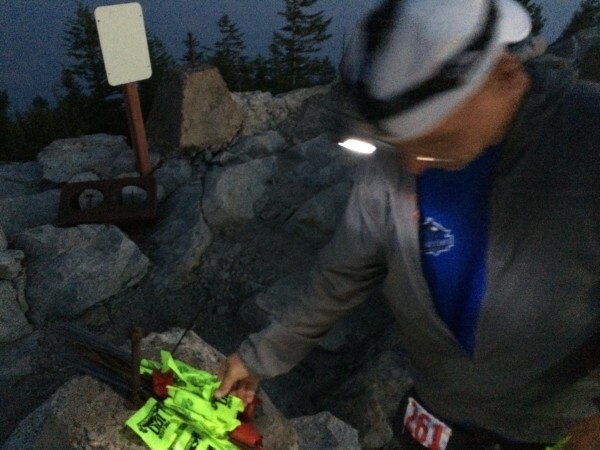 I arrived at the last aid station where I asked for my drop bag. I felt great and wanted every advantage, so I swallowed my fears and took the Vespa. I left lights, batteries, and night-time layers in my drop bag. 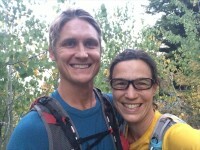 I finally pulled out my tunes and as I left the aid station I noticed a man and woman arriving. I wasn’t certain, but had a fair idea that the young woman was my competition and the man was her pacer. I set the iPod to my “Anthems” playlist, packed with favorites from different times of my life. I tried to stay enough ahead so that the woman behind couldn’t see me. Each time I saw a bend in the road, I would speed up to get around it, to be just out of view. In reality, I was probably out of her view the whole time, but I didn’t know that. I wasn’t looking back. I couldn’t believe that I was actually running at mile 90-something. Neil Diamond played in my ear bud. He had been a recurring theme of the day, as it turns out that few people can resist a little Song Sung Blue. During the day before, I had pulled out my iPhone on three occasions to host brief Neil Diamond dance parties on the trail. Now I was having my own private dance party, and I couldn’t have been happier. I passed a fellow from earlier in the day. 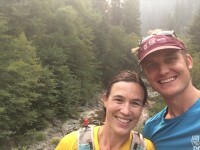 I think we had spent some time together in the wee nighttime hours on the Pacific Crest Trail (PCT). He and Tom were concerned because we hadn’t seen a course marking in some time and because the aid station was a solid 2 miles further than advertised. I shared concern about the aid station distance, but I was neither surprised nor annoyed. The distances had been loosy-goosy all day. I was certain that we had not missed a turn and used the course GPS tracks to confirm that we were still on-course. The men were still very worried and driving me nuts. The only thing to do is keep running. And we did, eventually, arrive at the mis-placed aid station. I wondered if there were any more distance surprises in these last 10 miles. Hal Koerner, the world’s most likable race director, mentioned that he had some “really fun” single track in store for us in the final miles as we dropped into Ashland. With fewer than 5 miles to go, I could see Ashland terribly far below us, and had a difficult time trying to figure out just what “really fun” could really mean. I blew past a water-only station and a sign that said “4 miles” on it. I kept going over the math in my head… maybe I am off by an hour? Am I really coming in under 28 hours? Is there any truth to that “4 miles” sign? And, then the big surprise… it really was really fun single track! It was a buffed-out downhill trail that was just a bit on the steep side. Now my only question, as I calculated a possible finish in less than 27 hours and a half hours: is there a mile of pavement in addition to these 2.8 miles, or is that included? The suspense was killing me. And, then, before I knew it, I was running down some of the steepest pavement I’d ever set foot on. Betsy’s husband Paul greeted me a few turns before the finish. 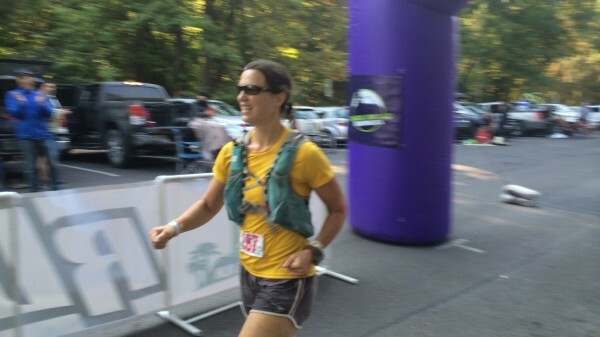 Betsy is so awesome ~ she was the third woman finisher (24:58) after running on a sprained ankle for 95 miles. Paul directed me around the final few turns and pointed out the finish arch in the middle of the street. The (college?) cross-country running team was running up the road as I approached the finish. “Go get high fives from them,” Paul advised. I couldn’t help but grin ear-to-ear as I slapped hands with a half-dozen shirtless 20-year-olds. 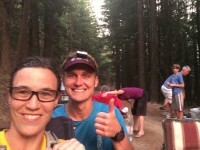 I completed the 100-mile course in 27 hours and 24 minutes. Tom, who had spent the bulk of the day with me, was cleaned up and waiting at the finish. He had slammed down the hill to finish in 26:46. Betsy and my parents also greeted me at the finish. It was my parents’ first opportunity to see me at one of my ultras and I was excited to have them there. I missed having my husband and kids there, but was confident that they were tracking from afar. My parents helped me retrieve my vehicle (a.k.a The Beast) from the start and we stayed for the finishing ceremony. Then we all ate a fabulous meal together. I slept well, then we all ate another fabulous meal together. And that was that. I am now “qualified” to put my name in the had for one of the few, coveted spots at the Hardrock 100. But just barely. 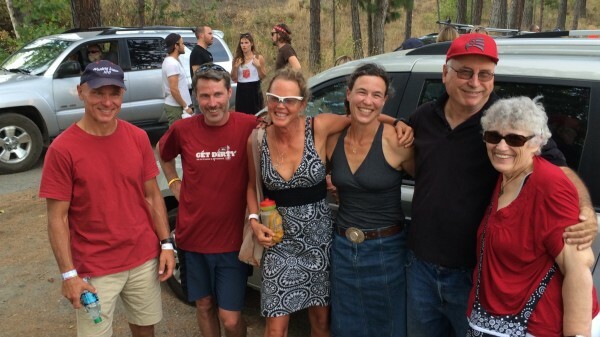 The day after my Pine to Palm finish, I received an email containing this statement: “Finishers of Pine to Palm 100 in 2013 and 2014 are qualified for the 2015 Hardrock, however Pine to Palm 100 will no longer be a qualifier after the 2016 HR.” I am thinking that, from now on, only I will decide what I am “qualified” to do… the Hardrock infatuation fades. Thanks – enjoyed your report. I signed up for 2016’s Pine to Palm and am already beginning obsessive googling for every bit of information out there. . . Would love to hear the story of what it took to get to Wagner Butte! Good luck with your training and preparations for Pine to Palm! I will be returning this year as crew for my husband. I think the important things to know for any 100 is that you must keep moving forward at any speed. Take care of yourself of aid stations, but don’t hang around. Late afternoon is always most difficult, especially on courses like P2P where it can get very hot. Remind yourself that it will be better once the sun sets and the day cools. Then the wee hours of the night become difficult as you get fatigued and possibly sleepy. Again, remind yourself that it will be better once the sun rises and the new day starts. All the best to you and don’t hesitate to contact me if you have specific questions.